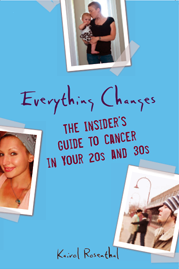 I was no clean freak before cancer. But when you rack up 70 plus hours a week on the couch, you begin to notice every dust bunny. I daydreamed about a cancer housecleaning organization, and I just found out my dream has come true. Cleaning for a Reason is a foundation that offers free housecleaning services to cancer patients. They match you up with cleaning services in your area who volunteer their time whipping your cancer shack into shape. They provide a general cleaning once a month, for four months during treatment. Visit their website to see if they offer services in your area and fill out the patient information form and waiver, which requires written proof from a doctor. They friggin clean your house for free. Few things get better than that. This service is only available to female cancer patients. What about single men who have cancer? What about married or coupled men with cancer whose partners are full-time caregiving on top of working a 40 hour a week jobs and raising kids? They need the power of clean too. I called the organization and pressed them for an explanation. “When the woman is down, the house falls apart,” they said. Okay, the organization is run by some ladies from Dallas who seem a bit stuck in the 1950’s. If you are a guy, just fill out the form and dress in drag when they arrive. Have any of you become neat freaks or more conscious of the cleanliness of your pad since you were diagnosed? P.S. 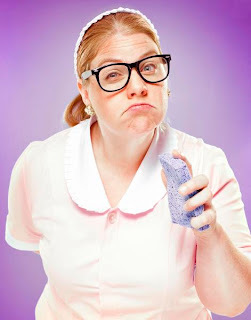 – Believe it or not, the woman in this photo from a Scrubbing Bubbles Dual Shower Cleaner ad is in fact Chris Blumer, the guest blogger who wrote Chemo 101 for Newbies. Not only am I more concerned about the cleanliness of my apartment since being diagnosed with cancer, I’m more careful about the products I use to clean it. I spend a whole lot more time reading ingredients and trying to find products that have the least amount of chemicals but still do the job! Oftentimes, I find myself cleaning with vinegar rather than Lysol- Cheaper and more environmentally friendly!